Starbucks Vietnam is set to open its first store in Ho Chi Minh City in February 2013. As usual, there is much discussion regarding whether Starbucks will be successful in Vietnam given the country’s rich coffee culture that was inherited from the French. Traditional Vietnamese coffee (using robusta beans) is served black (café) with sugar or with a heavy dose of condensed milk (café sữa). It is drunken either hot or with ice and usually costs between 10,000 – 30,000 VND (US$0.50 – US$1.50), depending on which city you are in and whether you are consuming the coffee inside a café or on street sidewalks. 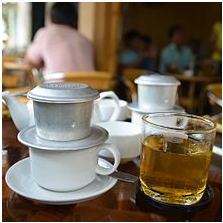 Vietnam traditionally is a tea-based society until coffee was introduced by the French in 1857. Vietnam has since become the world’s second largest exporter of robusta coffee in the world, second only to Brazil. Local coffee players such as Trung Nguyen Coffee, Highlands Coffee, Vinacafe, and Nestle Café dominate the a fast-growing market of coffee lovers in Vietnam. The latter two specialize in the ready-to-drink coffee powder mix segment. While international coffee chains like Coffee Bean and Tea Leaf and Gloria Jeans have entered Vietnam in the last four to five years, they have a combined store count of about 20 units in Ho Chi Minh City and Hanoi. This is but a small drop in a vast ocean littered with tens of thousands of Vietnamese coffee shops throughout the country. In addition to price and location advantages, local Vietnamese love the flavors of their coffee, flavors that are different whether you are in Hanoi, Danang or Ho Chi Minh City. Can Starbucks really be successful in Vietnam given the above challenges as well has high initial investment costs in a market where the rich and middle class are still a minority, arabica bean instead of the popular robusta bean-based coffee, high real estate costs, challenging supply chain, a full-service coffee culture (not self-serve), and young working professionals who still love their traditional café sữa đá, as it is known locally for iced coffee with milk? Time will tell, but I wouldn’t bet against Starbucks as iconic American brands usually go far in this part of the world, and unlike China and other similar countries, the Vietnamese already have a strong addiction to coffee, albeit not the “coffee experience” that Starbucks claims to deliver worldwide for a nice premium.